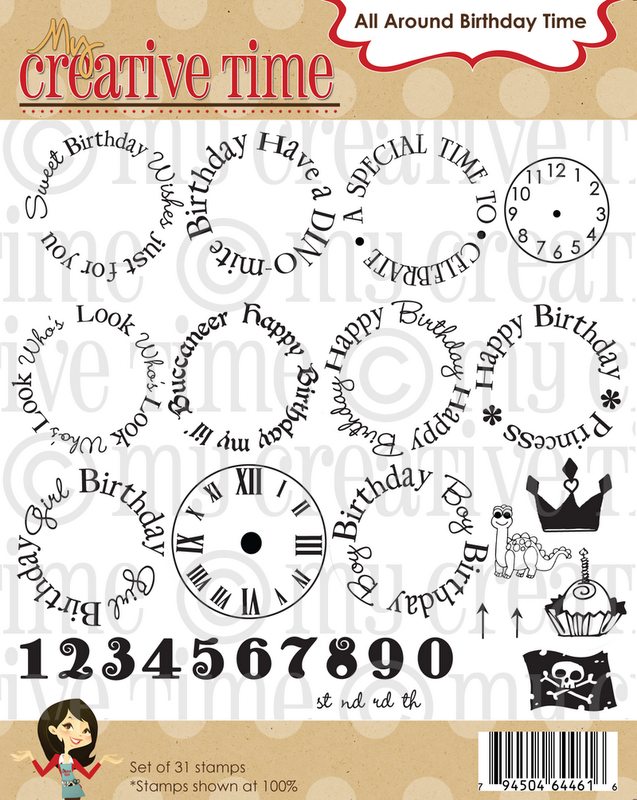 crafting with katie: My Creative Time October Stamp Release Blog Hop! The day you've been waiting for is finally here! Today you get to see all four of My Creative Time's fantastic new stamp sets! If you haven't been to Emma's site yet, head over there now to see her video introducing each of the sites. I had so much fun using All Around Birthday Time for my project today. I made this card for my aunt, who just turned 70 last weekend. It's a little late, but hopefully the cuteness will make up for it! She has a great sense of humor, so I think she'll get a kick out of the shocked looking flower. I made my three flowers using the My Creative Time Scallop & Stitched Circle Dies. 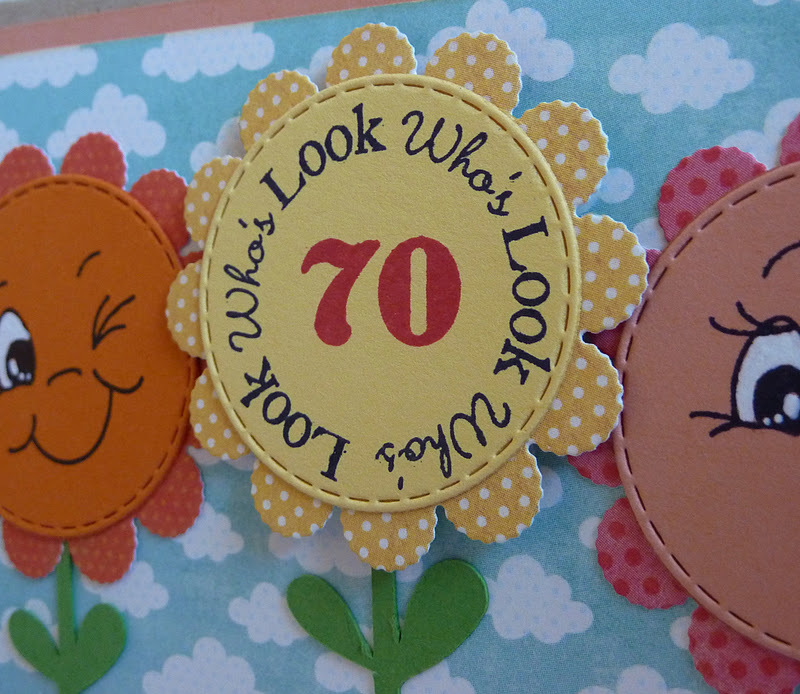 For the center sentiment, I stamped "Look Who's 70" from All Around Birthday Time and popped up the flower with some pop dots. 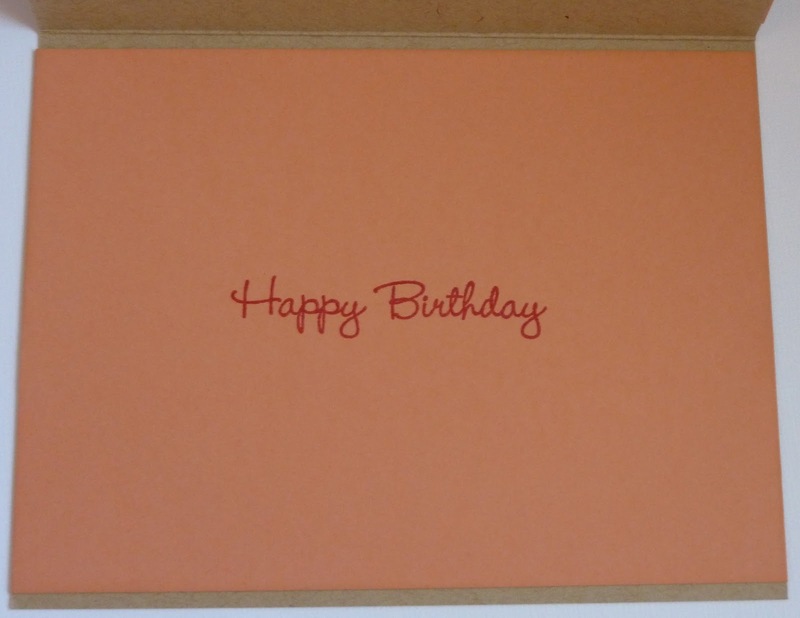 I just love how All Around Birthday Time has individual numbers so that I can personalize cards for specific birthdays. My other two flowers are stamped with Peachy Keen faces. I cut the flower stems at 2" and 2 1/2" from the Walk in My Garden Cricut cartridge. To create my grass, I cut it twice at 1 1/4" from Plantin Schoolbook. The first layer is adhered directly to the card, but I used pop dots for the second layer to add some dimension. For the inside of my card, I stamped my favorite "Happy Birthday" (I just love this font) from Emma's Gift Card Sentiments stamp set. 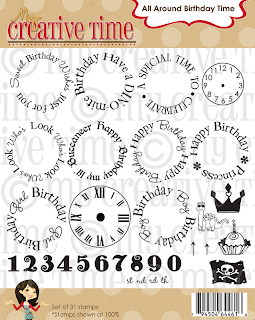 For my giveaway today, I have the All Around Birthday Time stamp set shown below, that I showcased today! To enter to win, just leave a comment here by Sunday at midnight! Your next stop on the hop is this amazingly talented and sweet Glora! Adorable card! Love Emma's new rounded sentiments. And those PK faces always make me smile. Thanks for sharing. Hee!! Love this! Great expressions on the flower faces. Too cute, Katie!! WOW!!!! LOVE THIS!!! VERY CUTE Miss Katie!!! This is definitely super cute. Love those little PK faces. Hi katie, very cute! card. glad to hop and new follower. Katie, I love this card. The faces, the clouds, the colors, everything! adorable card love the faces and the grass super cute. tfs. I just love your card! Great job on the grass! Great tip. TFS! The giveaway is my favorite of this release. Thank you for the chance to win. Love how you gave the flowers a personality. To Cute! Cute card. I just love the faces on the flower. This stamp set is my favorite! I love this set!! I can see so many uses for it. Your card is just so cute!! This is so adorable!! I love the flowers and love the colors!! Such a cute card! Your aunt will love it! what a great card!! I love the faces on the flowers! thanks so much for sharing your talents with us! Your card is soooo cute!! LOVE LOVE LOVE this stamp set. Thanks for the chance to win!! Adorable little card! And this was my absolute favorite set from this release! Thanks for sharing and giving so much inspiration all week long. This card is adorable. Love the dimension that the popped up grass gives the card! Love the stamps and the faces are just too cute! Thanks for the chance to win! How cute, I'm sure she will love it. This set is my favorite of the release. That's an adorable card; love that circle birthday sentiment--it's just perfect to use for any age!! Thanks for the chance to win it!--Pat N.
How ADORABLE!!! I LOVE the faces on those little flowers!!! Love it adorable card love the shocked look! Lol. Cute card Katie....love those faces!! What a lot of options with this set! I love your idea! Awww Katie... I love everything about your card. From the Cute PKS Faces used to the perfect chosen Printed Paper! Great Work Katie! 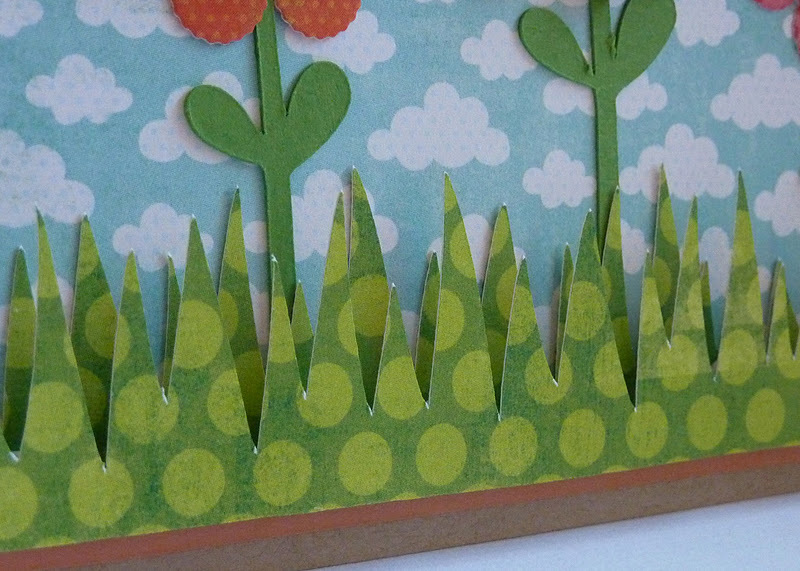 What a super cute card...love the dimensional grass. I thik this set and the XL label boarders are my favorite. Nice job this week! Cute card!! I love the faces you picked - goes perfect with 70!! And I love how you used those dies as flowers!! So super adorable. Love the dimension.Those faces fit perfect in those dies! This set rocks!!! Katie, LOVE your use of the scallops for flowers!!! Obvious, but I did not "see" it ... You are so stinkin' creative!!! Such a fun card; I know your aunt will treasure it!!! LOL.. I am sure your aunt is going to love this.. love your did the grass.. Super cute card Katie.. I love this card! I love the shocked look on the flower! Your aunt is going to love it! Thanks for sharing! OMG- that is a perfect card... for an older person. Love it! Soo cute...those peachy keen faces are great and fit perfect on Emma's Dies. :) This is my favorite stamp set this release...would love to win these. Thanks for the chance. I LOVE THIS CARD! The dies as flowers is ADORABLE! Adorable Katie, as all your projects always are! My favorite set. Love your card! Thanks for sharing. This is my favorite stamp set of the release. Your card is FABULOUS. I must try this. Thanks for sharing the recipe. Cute card. Love those peachy faces and the sentiment is great. Hi Katie- your card is just fabulous. Love the details & your use of the stamps. Way cute card!!!! I love this set. Such a cute card, your aunt will love it! Your flower birthday card is too cute!! Love the cute faces. Wow! Emmas new stamps are just fabulous!! Awww its so cute, love it, and I'm sure your Aunt will to!!! Love the card! I love how you used different colored ink for the "70" in your scallop. PK faces always put a smile on my face :) TFS. Love all the layering, nice job. TFS! Soooooooo cute. I love the flower faces. Your aunt is going to love her birthday card. Such a sweet card...your Aunt will love it! Clever to use the scallop die for flowers with Peachy faces. I love the floor faces. Great card!! I LOVE the expressions of the flowers!! Very cute card. I love the way everything coordinates with the PK face stamps! So adorable. Very cute card and love the shocked look on the flower. What a darling card...just LOVE the PK faces and the new circle stamps by Emma are just great! I love your card! I can see that I'll be "borrowing" your idea. :) TFS! Cutest card ever Katie. Thanks. What a sweet card, great idea to use the dies for the flowers and the Peachy faces. What a cute card! I'm sure your aunt will love it! I think the card is so cute !! You have such great ideas !! Enjoy the weekend !! 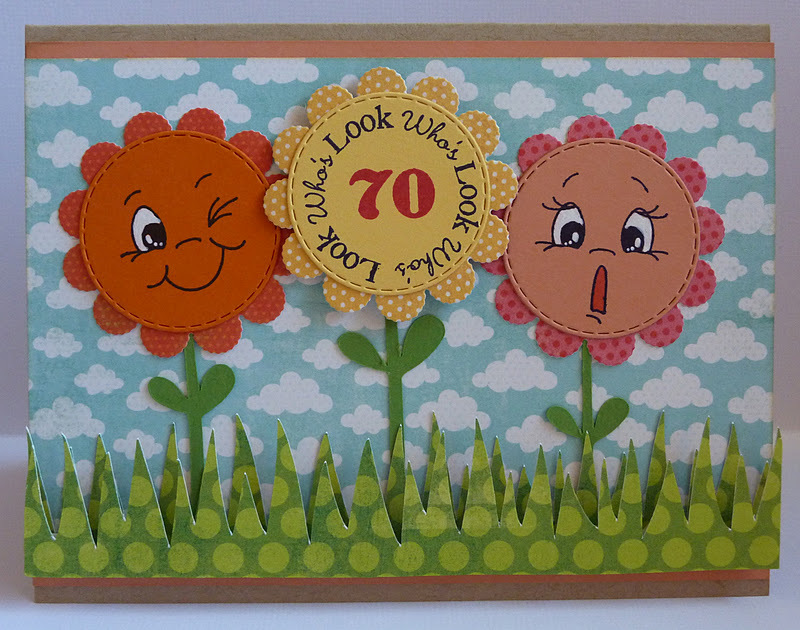 I love the use of the peachy keen faces on the flowers and what a great use of the MCT dies. Nice work! Your card is fabulous!! So cute with the PKS faces!! I love the new releases, but this one is my favorite!! What a cute card! This is my favorite stamps set of the new release! This is absolutely amazing and adorable!! Very cute! Love these round birthday sentiments! Your card is adorable! So adorable Katie! Thanks for the inspiration. Katie, this is so cute! Great, great job! This is my favorite set of the release! A very cute card, Thanks for the inspiration. Zoe. Love it!! Your card with the faces is so cute! Well done!!!! Katie!!! Your card is absolutely awesome!!! Love EVERYTHING about it!! Your Aunt will too! Love the sentiments in the round! So clever and cute! Katie- what an adorable card!! I love the All Around Birthday Set & can't wait to add it to my collection! Oh, what an adorable pop up project using my favorite release set. Nice card, this stamp set is so adorable. I think you have changed my mind about which one I love the most. This card is soooooo cute. Thanks for the chance to win this set. This is my fav. stamp set of the new releases!!! I love the versatility! Thank you so much! You're so creative Katie. I love looking at your cards and other projects. OH MISS KATIE!!! This is my favorite set of the new realease and your card is just tooooo cute for words!!!! I LOVE how you popped up the grass...love it!!! I know your Aunt will LOVE this card!!!! very cute flowers, such a great way to use Emma's new stamp set! Now how darn cute is I that???!! Love the way you used the stitched circle and scallop die to make the flower, very creative. :) Of course you gotta love those PK faces too. Your card is adorable. What a clever way to showcase the stamp! I love the card, its very cute. What a pretty card. I love this circle die with the stitching and this set goes so well with it. Very Very Cute! Thanks for a chance to win. Added you to my blog list! Love your Peachy Keen faces, adds so much to the card. This is my favorite of Emmas new release. Great job! Wow Katie! I want this set! Love your flowers and I already have the dies - thanks for idea! Gosh this would be fun to win! Love your card! thanks for a chance to win! I would love to have those stamps! So cute. Love the stamps! Thanks so much for the chance at this great candy giveaway. You made a beautiful card - bet whoever receives it will love it! You're right that having the individual numbers that you can use however you want is a great idea. Love this set. Sorry forgot email:marg0006@verizon.net and blog is Loving Scrapper 101.
love your card, fantastic!!! this is my favorite stamp set from this release!!! Your Aunt is going to love this card! What a fantastic stamp set! So adorable!! So creative... LOVE it!! I just adore Ms. Emma's stamps. Super cute card. Katie, what a sweet card, it's adorable!!! Love Emma's stamps!!! I'm sure your aunt will forgive because of the cuteness factor!! It is adorable!! It seems so obvious to use that die set for flowers, yet I never would have thought of it! The peachy faces were a perfect choice, too. I'm sure your Aunt will forgive you! Adorable! I love how you used the stamps to create the flower! so cute. I like how you cut the grass twice. It looks adorable.